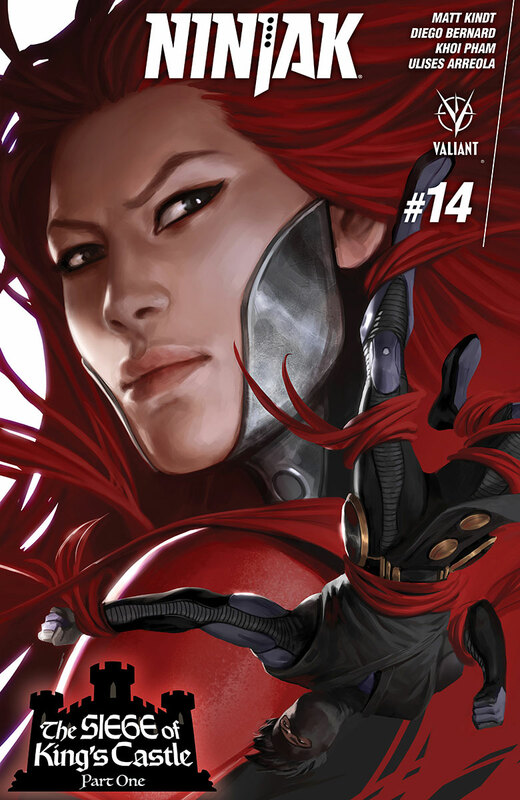 The Fellowship was fortunate enough to obtain a copy of NINJAK #14 from Valiant Comics. The story is by Matt Kindt, with art by Diego Bernard, colors by Arreola with Pantazis, and lettering by Dave Sharpe. Colin King (A.K.A. Ninjak) is returning home for some much needed rest and relaxation. After finally clearing his mind, he realizes something is wrong…almost too late. In a short period of time he is listed on Interpol’s top tenmost wanted list, has no resources, nowhere to go, and no one to turn to. Well, there may be one person. But who has the ability to do all of this and why? That’s what Colin wants to know! In the backup tale (with art by Khoi Pham and colors by Dalhouse with Cox) focuses on a mission involving two agents of the British Secret Intelligence Service that happened years ago. Ninjak is an awesome character and glad he has his own series. Of course he is in the capable hands of Matt Kindt. After dealing with crazy supernatural stuff in the last arc, this is pure action and intrigue. Valiant Comics state Diego Bernard is a rising star, and this issue shows you that it’s not an idle boast. This is a nice jumping on point as this is a start of a new story arc. NINJAK #14 is in stores now, or available for ordering at www.valiantentertainment.com.